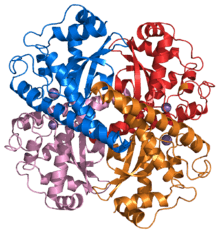 Superoxide dismutase (SOD, EC 1.15.1.1) is an enzyme that alternately catalyzes the dismutation (or partitioning) of the superoxide (O2−) radical into either ordinary molecular oxygen (O2) or hydrogen peroxide (H2O2). Superoxide is produced as a by-product of oxygen metabolism and, if not regulated, causes many types of cell damage. Hydrogen peroxide is also damaging, but less so, and is degraded by other enzymes such as catalase. Thus, SOD is an important antioxidant defense in nearly all living cells exposed to oxygen. One exception is Lactobacillus plantarum and related lactobacilli, which use a different mechanism to prevent damage from reactive (O2−). In higher plants, superoxide dismutase enzymes (SODs) act as antioxidants and protect cellular components from being oxidized by reactive oxygen species (ROS). ROS can form as a result of drought, injury, herbicides and pesticides, ozone, plant metabolic activity, nutrient deficiencies, photoinhibition, temperature above and below ground, toxic metals, and UV or gamma rays. To be specific, molecular O2 is reduced to O2− (an ROS called superoxide) when it absorbs an excited electron released from compounds of the electron transport chain. 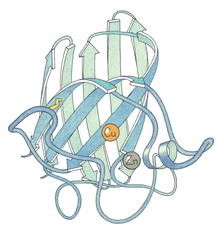 Superoxide is known to denature enzymes, oxidize lipids, and fragment DNA. SODs catalyze the production of O2 and H2O2 from superoxide (O2−), which results in less harmful reactants. Superoxide is one of the main reactive oxygen species in the cell. As a consequence, SOD serves a key antioxidant role. The physiological importance of SODs is illustrated by the severe pathologies evident in mice genetically engineered to lack these enzymes. Mice lacking SOD2 die several days after birth, amid massive oxidative stress. Mice lacking SOD1 develop a wide range of pathologies, including hepatocellular carcinoma, an acceleration of age-related muscle mass loss, an earlier incidence of cataracts and a reduced lifespan. Mice lacking SOD3 do not show any obvious defects and exhibit a normal lifespan, though they are more sensitive to hyperoxic injury. Knockout mice of any SOD enzyme are more sensitive to the lethal effects of superoxide-generating compounds, such as paraquat and diquat (herbicides). Drosophila lacking SOD1 have a dramatically shortened lifespan, whereas flies lacking SOD2 die before birth. SOD knockdowns in C. elegans do not cause major physiological disruptions. Knockout or null mutations in SOD1 are highly detrimental to aerobic growth in the yeast Saccharomyces cerevisiae and result in a dramatic reduction in post-diauxic lifespan. SOD2 knockout or null mutations cause growth inhibition on respiratory carbon sources in addition to decreased post-diauxic lifespan. Mutations in the first SOD enzyme (SOD1) can cause familial amyotrophic lateral sclerosis (ALS, a form of motor neuron disease). The most common mutation in the U.S. is A4V, while the most intensely studied is G93A. The other two isoforms of SOD have not been linked to any human diseases, however, in mice inactivation of SOD2 causes perinatal lethality and inactivation of SOD1 causes hepatocellular carcinoma. Mutations in SOD1 can cause familial ALS (several pieces of evidence also show that wild-type SOD1, under conditions of cellular stress, is implicated in a significant fraction of sporadic ALS cases, which represent 90% of ALS patients. 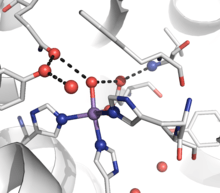 ), by a mechanism that is presently not understood, but not due to loss of enzymatic activity or a decrease in the conformational stability of the SOD1 protein. Overexpression of SOD1 has been linked to the neural disorders seen in Down syndrome. In patients with thalassemia, SOD will increase as a form of compensation mechanism. However, in the chronic stage, SOD does not seem to be insufficient and tends to decrease due to the destruction of proteins from the massive reaction of oxidant-antioxidant. SOD has powerful antinflammatory activity. For example, SOD is a highly effective experimental treatment of chronic inflammation in colitis. Treatment with SOD decreases reactive oxygen species generation and oxidative stress and, thus, inhibits endothelial activation and indicate that modulation of factors that govern adhesion molecule expression and leukocyte-endothelial interactions. Therefore, such antioxidants may be important new therapies for the treatment of inflammatory bowel disease. Likewise, SOD has multiple pharmacological activities. E.g., it ameliorates cis-platinum-induced nephrotoxicity in rodents. As "Orgotein" or "ontosein", a pharmacologically-active purified bovine liver SOD, it is also effective in the treatment of urinary tract inflammatory disease in man. For a time, bovine liver SOD even had regulatory approval in several European countries for such use. This was truncated by concerns about prion disease. SOD may reduce free radical damage to skin—for example, to reduce fibrosis following radiation for breast cancer. Studies of this kind must be regarded as tentative, however, as there were not adequate controls in the study including a lack of randomization, double-blinding, or placebo. Superoxide dismutase is known to reverse fibrosis, perhaps through reversion of myofibroblasts back to fibroblasts. SOD is commercially obtained from marine phytoplankton,bovine liver, horseradish, cantaloupe and by fermenting certain bacteria, though it is found in most living forms at diverse concentrations. For therapeutic purpose, SOD is usually injected locally. There is no evidence that ingestion of unprotected SOD or SOD-rich foods can have any physiological effects: as all ingested SOD is broken down into amino acids before being absorbed. However, ingestion of SOD bound to wheat proteins could improve its therapeutic activity, at least in theory. 1 2 PDB: 1VAR​; Borgstahl GE, Parge HE, Hickey MJ, Johnson MJ, Boissinot M, Hallewell RA, Lepock JR, Cabelli DE, Tainer JA (April 1996). "Human mitochondrial manganese superoxide dismutase polymorphic variant Ile58Thr reduces activity by destabilizing the tetrameric interface". Biochemistry. 35 (14): 4287–97. doi:10.1021/bi951892w. PMID 8605177. ↑ McCord JM, Fridovich I (Nov 1969). "Superoxide dismutase. An enzymic function for erythrocuprein (hemocuprein)". The Journal of Biological Chemistry. 244 (22): 6049–55. PMID 5389100. ↑ McCord JM, Fridovich I (1988). "Superoxide dismutase: the first twenty years (1968-1988)". Free Radical Biology & Medicine. 5 (5-6): 363–9. doi:10.1016/0891-5849(88)90109-8. PMID 2855736. ↑ Brewer GJ (Sep 1967). "Achromatic regions of tetrazolium stained starch gels: inherited electrophoretic variation". American Journal of Human Genetics. 19 (5): 674–80. PMC 1706241 . PMID 4292999. 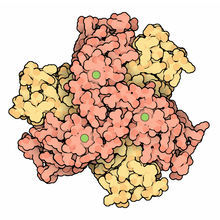 ↑ PDB: 2SOD​; Tainer JA, Getzoff ED, Beem KM, Richardson JS, Richardson DC (September 1982). "Determination and analysis of the 2 A-structure of copper, zinc superoxide dismutase". J. Mol. Biol. 160 (2): 181–217. doi:10.1016/0022-2836(82)90174-7. PMID 7175933. ↑ Quint P, Reutzel R, Mikulski R, McKenna R, Silverman DN (Feb 2006). "Crystal structure of nitrated human manganese superoxide dismutase: mechanism of inactivation". Free Radical Biology & Medicine. 40 (3): 453–8. doi:10.1016/j.freeradbiomed.2005.08.045. PMID 16443160. ↑ Richardson J, Thomas KA, Rubin BH, Richardson DC (Apr 1975). "Crystal structure of bovine Cu,Zn superoxide dismutase at 3 A resolution: chain tracing and metal ligands". Proceedings of the National Academy of Sciences of the United States of America. 72 (4): 1349–53. doi:10.1073/pnas.72.4.1349. PMC 432531 . PMID 1055410. .
↑ Tainer JA, Getzoff ED, Richardson JS, Richardson DC (1983). "Structure and mechanism of copper, zinc superoxide dismutase". Nature. 306 (5940): 284–7. doi:10.1038/306284a0. PMID 6316150. 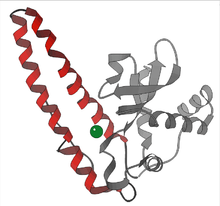 1 2 3 PDB: 1N0J​; Borgstahl GE, Parge HE, Hickey MJ, Beyer WF, Hallewell RA, Tainer JA (Oct 1992). "The structure of human mitochondrial manganese superoxide dismutase reveals a novel tetrameric interface of two 4-helix bundles". Cell. 71 (1): 107–18. doi:10.1016/0092-8674(92)90270-M. PMID 1394426. ↑ Barondeau DP, Kassmann CJ, Bruns CK, Tainer JA, Getzoff ED (Jun 2004). "Nickel superoxide dismutase structure and mechanism". Biochemistry. 43 (25): 8038–47. doi:10.1021/bi0496081. PMID 15209499. 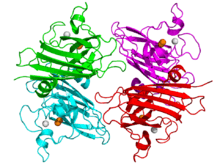 1 2 PDB: 1Q0M​; Wuerges J, Lee JW, Yim YI, Yim HS, Kang SO, Djinovic Carugo K (Jun 2004). "Crystal structure of nickel-containing superoxide dismutase reveals another type of active site". Proceedings of the National Academy of Sciences of the United States of America. 101 (23): 8569–74. doi:10.1073/pnas.0308514101. PMC 423235 . PMID 15173586. ↑ PDB: 1SDY​; Djinović K, Gatti G, Coda A, Antolini L, Pelosi G, Desideri A, Falconi M, Marmocchi F, Rolilio G, Bolognesi M (December 1991). "Structure solution and molecular dynamics refinement of the yeast Cu,Zn enzyme superoxide dismutase". Acta Crystallogr. B. 47 (6): 918–27. doi:10.1107/S0108768191004949. PMID 1772629. ↑ Corpas FJ, Barroso JB, del Río LA (Apr 2001). "Peroxisomes as a source of reactive oxygen species and nitric oxide signal molecules in plant cells". Trends in Plant Science. 6 (4): 145–50. doi:10.1016/S1360-1385(01)01898-2. PMID 11286918. ↑ Corpas FJ, Fernández-Ocaña A, Carreras A, Valderrama R, Luque F, Esteban FJ, Rodríguez-Serrano M, Chaki M, Pedrajas JR, Sandalio LM, del Río LA, Barroso JB (Jul 2006). "The expression of different superoxide dismutase forms is cell-type dependent in olive (Olea europaea L.) leaves". Plant & Cell Physiology. 47 (7): 984–94. doi:10.1093/pcp/pcj071. PMID 16766574. ↑ PDB: 3CQQ​; Cao X, Antonyuk SV, Seetharaman SV, Whitson LJ, Taylor AB, Holloway SP, Strange RW, Doucette PA, Valentine JS, Tiwari A, Hayward LJ, Padua S, Cohlberg JA, Hasnain SS, Hart PJ (June 2008). "Structures of the G85R variant of SOD1 in familial amyotrophic lateral sclerosis". J. Biol. Chem. 283 (23): 16169–77. doi:10.1074/jbc.M801522200. PMC 2414278 . PMID 18378676. ↑ PDB: 2JLP​; Antonyuk SV, Strange RW, Marklund SL, Hasnain SS (May 2009). "The structure of human extracellular copper-zinc superoxide dismutase at 1.7 A resolution: insights into heparin and collagen binding". J. Mol. Biol. 388 (2): 310–26. doi:10.1016/j.jmb.2009.03.026. PMID 19289127. 1 2 Alscher RG, Erturk N, Heath LS (May 2002). "Role of superoxide dismutases (SODs) in controlling oxidative stress in plants". Journal of Experimental Botany. 53 (372): 1331–41. doi:10.1093/jexbot/53.372.1331. PMID 11997379. 1 2 3 Smirnoff, Nicholas (1993). "Tansley Review No. 52 The role of active oxygen in the response of plants to water deficit and desiccation". Plant Phytology. 125. 1 2 Raychaudhuri SS, Deng XW (2008). "The Role of Superoxide Dismutase in Combating Oxidative Stress in Higher Plants". The Botanical Review. 66 (1): 89–98. doi:10.1007/BF02857783. ↑ Vanaporn M, Wand M, Michell SL, Sarkar-Tyson M, Ireland P, Goldman S, Kewcharoenwong C, Rinchai D, Lertmemongkolchai G, Titball RW (Aug 2011). "Superoxide dismutase C is required for intracellular survival and virulence of Burkholderia pseudomallei". Microbiology. 157 (Pt 8): 2392–400. doi:10.1099/mic.0.050823-0. PMID 21659326. ↑ Gardner PR, Raineri I, Epstein LB, White CW (Jun 1995). "Superoxide radical and iron modulate aconitase activity in mammalian cells". The Journal of Biological Chemistry. 270 (22): 13399–405. doi:10.1074/jbc.270.22.13399. PMID 7768942. 1 2 Li Y, Huang TT, Carlson EJ, Melov S, Ursell PC, Olson JL, Noble LJ, Yoshimura MP, Berger C, Chan PH, Wallace DC, Epstein CJ (Dec 1995). "Dilated cardiomyopathy and neonatal lethality in mutant mice lacking manganese superoxide dismutase". Nature Genetics. 11 (4): 376–81. doi:10.1038/ng1295-376. PMID 7493016. 1 2 Elchuri S, Oberley TD, Qi W, Eisenstein RS, Jackson Roberts L, Van Remmen H, Epstein CJ, Huang TT (Jan 2005). "CuZnSOD deficiency leads to persistent and widespread oxidative damage and hepatocarcinogenesis later in life". Oncogene. 24 (3): 367–80. doi:10.1038/sj.onc.1208207. PMID 15531919. ↑ Muller FL, Song W, Liu Y, Chaudhuri A, Pieke-Dahl S, Strong R, Huang TT, Epstein CJ, Roberts LJ, Csete M, Faulkner JA, Van Remmen H (Jun 2006). "Absence of CuZn superoxide dismutase leads to elevated oxidative stress and acceleration of age-dependent skeletal muscle atrophy". Free Radical Biology & Medicine. 40 (11): 1993–2004. doi:10.1016/j.freeradbiomed.2006.01.036. PMID 16716900. ↑ Sentman ML, Granström M, Jakobson H, Reaume A, Basu S, Marklund SL (Mar 2006). "Phenotypes of mice lacking extracellular superoxide dismutase and copper- and zinc-containing superoxide dismutase". The Journal of Biological Chemistry. 281 (11): 6904–9. doi:10.1074/jbc.M510764200. PMID 16377630. ↑ Milani P, Gagliardi S, Cova E, Cereda C (2011). "SOD1 Transcriptional and Posttranscriptional Regulation and Its Potential Implications in ALS". Neurology Research International. 2011: 458427. doi:10.1155/2011/458427. PMC 3096450 . PMID 21603028. ↑ Deng HX, Hentati A, Tainer JA, Iqbal Z, Cayabyab A, Hung WY, Getzoff ED, Hu P, Herzfeldt B, Roos RP (Aug 1993). "Amyotrophic lateral sclerosis and structural defects in Cu,Zn superoxide dismutase". Science. 261 (5124): 1047–51. doi:10.1126/science.8351519. PMID 8351519. ↑ Conwit RA (Dec 2006). "Preventing familial ALS: a clinical trial may be feasible but is an efficacy trial warranted?". Journal of the Neurological Sciences. 251 (1-2): 1–2. doi:10.1016/j.jns.2006.07.009. PMID 17070848. ↑ Al-Chalabi A, Leigh PN (Aug 2000). "Recent advances in amyotrophic lateral sclerosis". Current Opinion in Neurology. 13 (4): 397–405. doi:10.1097/00019052-200008000-00006. PMID 10970056. ↑ Gagliardi S, Cova E, Davin A, Guareschi S, Abel K, Alvisi E, Laforenza U, Ghidoni R, Cashman JR, Ceroni M, Cereda C (Aug 2010). "SOD1 mRNA expression in sporadic amyotrophic lateral sclerosis". Neurobiology of Disease. 39 (2): 198–203. doi:10.1016/j.nbd.2010.04.008. PMID 20399857. ↑ Groner Y, Elroy-Stein O, Avraham KB, Schickler M, Knobler H, Minc-Golomb D, Bar-Peled O, Yarom R, Rotshenker S (1994). "Cell damage by excess CuZnSOD and Down's syndrome". Biomedicine & Pharmacotherapy = Biomédecine & Pharmacothérapie. 48 (5-6): 231–40. doi:10.1016/0753-3322(94)90138-4. PMID 7999984. ↑ Rujito L, Mulatsih S, Sofro AS (May 2015). "Status of Superoxide Dismutase in Transfusion Dependent Thalassaemia". North American Journal of Medical Sciences. 7 (5): 194–8. doi:10.4103/1947-2714.157480. PMID 26110130. ↑ Gongora MC, Qin Z, Laude K, Kim HW, McCann L, Folz JR, Dikalov S, Fukai T, Harrison DG (Sep 2006). "Role of extracellular superoxide dismutase in hypertension". Hypertension. 48 (3): 473–81. doi:10.1161/01.HYP.0000235682.47673.ab. PMID 16864745. ↑ Lob HE, Marvar PJ, Guzik TJ, Sharma S, McCann LA, Weyand C, Gordon FJ, Harrison DG (Feb 2010). "Induction of hypertension and peripheral inflammation by reduction of extracellular superoxide dismutase in the central nervous system". Hypertension. 55 (2): 277–83, 6p following 283. doi:10.1161/HYPERTENSIONAHA.109.142646. PMC 2813894 . PMID 20008675. ↑ Young RP, Hopkins R, Black PN, Eddy C, Wu L, Gamble GD, Mills GD, Garrett JE, Eaton TE, Rees MI (May 2006). "Functional variants of antioxidant genes in smokers with COPD and in those with normal lung function". Thorax. 61 (5): 394–9. doi:10.1136/thx.2005.048512. PMC 2111196 . PMID 16467073. ↑ Ganguly K, Depner M, Fattman C, Bein K, Oury TD, Wesselkamper SC, Borchers MT, Schreiber M, Gao F, von Mutius E, Kabesch M, Leikauf GD, Schulz H (May 2009). "Superoxide dismutase 3, extracellular (SOD3) variants and lung function". Physiological Genomics. 37 (3): 260–7. doi:10.1152/physiolgenomics.90363.2008. PMC 2685504 . PMID 19318538. ↑ Gongora MC, Lob HE, Landmesser U, Guzik TJ, Martin WD, Ozumi K, Wall SM, Wilson DS, Murthy N, Gravanis M, Fukai T, Harrison DG (Oct 2008). "Loss of extracellular superoxide dismutase leads to acute lung damage in the presence of ambient air: a potential mechanism underlying adult respiratory distress syndrome". The American Journal of Pathology. 173 (4): 915–26. doi:10.2353/ajpath.2008.080119. PMC 2543061 . PMID 18787098. ↑ Seguí J, Gironella M, Sans M, Granell S, Gil F, Gimeno M, Coronel P, Piqué JM, Panés J (Sep 2004). "Superoxide dismutase ameliorates TNBS-induced colitis by reducing oxidative stress, adhesion molecule expression, and leukocyte recruitment into the inflamed intestine". Journal of Leukocyte Biology. 76 (3): 537–44. doi:10.1189/jlb.0304196. PMID 15197232. ↑ McGinness JE, Proctor PH, Demopoulos HB, Hokanson JA, Kirkpatrick DS (1978). "Amelioration of cis-platinum nephrotoxicity by orgotein (superoxide dismutase)". Physiological Chemistry and Physics. 10 (3): 267–77. PMID 733940. ↑ Marberger H, Huber W, Bartsch G, Schulte T, Swoboda P (1974). "Orgotein: a new antiinflammatory metalloprotein drug evaluation of clinical efficacy and safety in inflammatory conditions of the urinary tract". International Urology and Nephrology. 6 (2): 61–74. doi:10.1007/bf02081999. PMID 4615073. ↑ Wilcox CS (May 2010). "Effects of tempol and redox-cycling nitroxides in models of oxidative stress". Pharmacology & Therapeutics. 126 (2): 119–45. doi:10.1016/j.pharmthera.2010.01.003. PMC 2854323 . PMID 20153367. ↑ Campana F, Zervoudis S, Perdereau B, Gez E, Fourquet A, Badiu C, Tsakiris G, Koulaloglou S (2004). "Topical superoxide dismutase reduces post-irradiation breast cancer fibrosis". Journal of Cellular and Molecular Medicine. 8 (1): 109–16. doi:10.1111/j.1582-4934.2004.tb00265.x. PMID 15090266. ↑ Vozenin-Brotons MC, Sivan V, Gault N, Renard C, Geffrotin C, Delanian S, Lefaix JL, Martin M (Jan 2001). "Antifibrotic action of Cu/Zn SOD is mediated by TGF-beta1 repression and phenotypic reversion of myofibroblasts". Free Radical Biology & Medicine. 30 (1): 30–42. doi:10.1016/S0891-5849(00)00431-7. PMID 11134893. ↑ Romao S (Mar 2015). "Therapeutic value of oral supplementation with melon superoxide dismutase and wheat gliadin combination". Nutrition. 31 (3): 430–6. doi:10.1016/j.nut.2014.10.006. PMID 25701330.